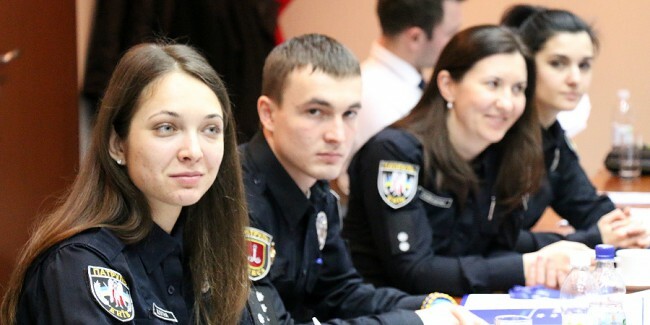 ‘To protect and to serve’ is not only the motto of the newly created National Police of Ukraine, it also underpins an entire philosophy about what policing represents in a democratic society. In far too many countries, including Ukraine unfortunately, the police has been used as a tool to exercise and maintain power. The new National Police of Ukraine marks an important break with the past. Huge strides have been made in changing the culture and structure of policing in this country. The police should not be instruments of the state, but servants of the people. Now it is time to make the Ukrainian police even more responsive to the needs of the community. Our colleagues in the National Police of Ukraine recognise this and the international community, including the institution I work for, the EU Advisory Mission Ukraine, has committed to offering practical assistance in establishing a genuine model of community policing. But what is community policing? Let me give an example. If in a particular area, the level of crime goes up and the police successfully arrest more criminals, can this be considered a success? Partially. But at the same time the rise in crime represents a huge societal failure. Success would mean the police building a trusted relationship with the community to ensure that crime does not happen in the first place. A second example, this time from my experience as a police officer. When I was a young patrol Sergeant in the northeast of England, I was walking past a green area near some houses. Several youths were playing football and making noise in what was meant to be a quiet area for pensioners. I cautioned them and told them to stop playing and go elsewhere. At the time, I was convinced that I had done the right thing and that local residents would be grateful that I had dealt with a problem i.e. noisy youths. I was again in the area the next day when I was approached by several local residents. I expected that they wished to thank me for my swift actions with the youths. In fact, they proceeded to tell me that a year before a child had been killed while playing football in the street. Since that accident, parents had encouraged the kids to play on the green where they were at least safe from traffic. And the residents of the nearby pensioners’ estate were happy for the children to play there. The mistake that I made was that I assumed that I knew what was best. Youths were not meant to be playing on that green area. But the community had other needs, which I did not take into account. When people think of policing, violent crime and flashing lights often come to mind. But smaller scale incidents can also have a serious impact on the quality of a citizen’s life. A broken street lamp can lead to opportunist thieves attacking in the dark; a neighbour with a tendency to be aggressive or play loud music in the middle of the night can be frightening or upsetting. A ‘traditional’ police force might investigate the different thefts related to the broken lamp or pay regular visits to the noisy neighbour. A modern police force will work with the community, including other public services to get to the root of the problem and fix it. A crucial part of the new policing approach in Ukraine is moving from a reactive model of policing i.e. dealing with each incident as it is reported, to a proactive model of policing i.e. looking at the underlying cause of incidents. A proactive approach recognises that issues are rarely black and white. One area’s noisy and aggressive teenagers who frighten pensioners may be another area’s youths looking for a place to play. This is why involving the local community and training police to use their judgement at all stages is so important. Involving the local community in Western countries usually takes the form of Citizen’s Advisory Groups. These groups often include elected representatives, members of the local business community, employees of public bodies (for example teachers, hospital workers etc.) or religious leaders. These groups can help identify hot spots where crime or anti-social behaviour take place and assist in drawing up action plans to solve problems. Ukrainians have shown an admirable level of citizen involvement in defending their democracy, but have not traditionally been encouraged to take part in day to day governance. Police officers have also not traditionally been encouraged in Ukraine to use their individual judgement. Large organisations – which police forces usually are – are well known across the world for adopting bureaucratic management styles. But policing is a job where quick decision making on the spot is vital. Police cannot do their job effectively if they are constantly referring to protocols or expecting decisions from central authorities. A community policing model trains police officers to take effective decisions as close as possible to the point of service delivery. Community policing is based on building trust with the local community. This involves transparency and openness in relation to police activities. People expect and deserve information about policing styles, operations and incidents, as well as respect for and protection of human rights. Trust requires treating members of the public as customers that have needs to be met and accountability for actions. It is sustained by a demonstrable commitment to delivering the best possible service and communicating improvements, accompanied by a willingness to listen to and act upon public opinion regarding policing priorities. Changing the culture of policing in Ukraine will not happen overnight. But these step by step changes are is extremely important. As repeated surveys have demonstrated, trust in the police was low. This is dangerous for a democracy, because without trust in public institutions, democracy cannot function. It is positive that the National Police has identified community policing as a priority and at their invitation, I have spent the past month offering two training programmes in community policing for a new generation of police officers. The enthusiasm with which they have responded to the programme fills me with great optimism for the future. Timothy Shilston is a retired British police officer working as a community police advisor for the EU Advisory Mission Ukraine (EUAM). He served for 30 years in the Northumbria police, headquartered in Newcastle in northeast England. He has also served as a police advisor in international missions to Afghanistan and Palestine. EUAM is currently working with the National Police of Ukraine on concepts of community policing and training police officers on how to apply them.